It was snowing in the cold Pennsylvania pre-dawn as Caryl Baum's limousine made its way to the airport for her flight. She was going to her goddaughter Kelly's funeral in Tallahassee. The girl, whose heart had unexpectedly stopped after jogging, had been only 22, and Caryl was inconsolable at the loss. Somehow she would have to be strong for Kelly's parents, to carry some sort of message of hope. "During the drive I prayed that God would inspire me," she says. As Caryl stepped from the car in front of the terminal, two gorgeous white doves suddenly flew out of the snowy sky, directly toward her. "They swooped down in front of me, then soared up into the air and disappeared into the snow," Caryl recalls. "I felt it had to be some kind of sign, since I had never seen doves in winter. I thanked God, and felt a rush of warmth through me." After she arrived in Tallahassee, Caryl tried to tell Kelly's distraught parents about the doves, and their untimely appearance. They could barely concentrate. "I'm not sure they believed me, and of course it could have just been a coincidence," she says. The service began, and those in attendance mourned deeply. How could anyone find something hopeful in this situation? But as the mourners were coming out of the church behind the ministers and the casket, someone cried, "Look!" Another pair of snow-white doves appeared. This time, they glided up off the grass into the sky, swooped back down in front of everyone, then circled up and over the casket. "They were so close, we could feel the air from their wings on our cheeks," Caryl says. Everyone stood there, astonished. "Were those birds--or angels?" one man asked. "I have never felt such heavenly energy," the minister added. Kelly's parents smiled through their tears. 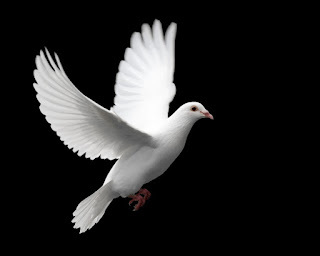 Doves, they knew, were a promise of new life. Caryl felt graced. It was just a little sign, she knew. But God had cared enough to send it not just once, for her, but again, thousands of miles away for the whole congregation. Dear Lord we thank You for the reminders that You send our way, even in the shape of a bird. What a great sign it is. We pray that our eyes would be open to see Your wonders. In Jesus’ name, Amen.